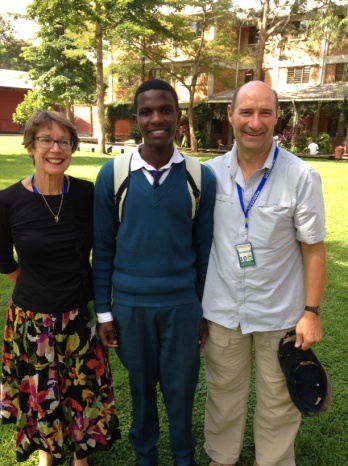 In 2002 Gemma Sisia started the School of St Jude in Arusha, Tanzania with 3 pupils and staffed by volunteers. 14 years later the school has a primary and a secondary campus, two boarding establishments, educates around 1,800 students and employs more than 250 fulltime local staff including teachers, cleaners, cooks, security guards, bus drivers and maintenance personnel. This is a truly inspirational story and one that would not have happened with the support of many Rotarians and Rotary clubs. During a safari in Tanzania Gemma fell in love with her safari guide Richard Sisia (both shown in picture). 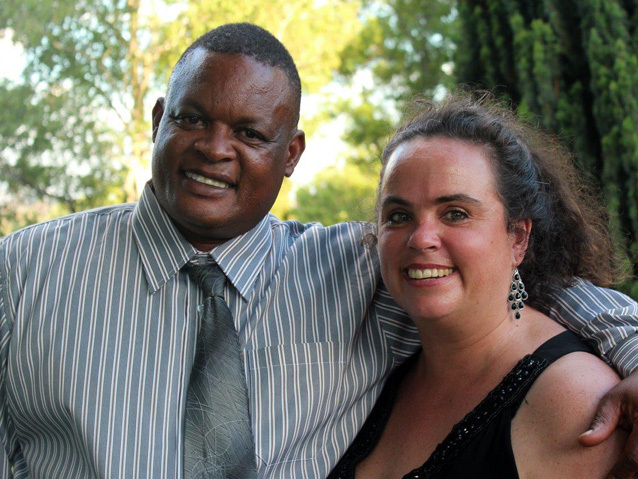 After their marriage Gemma decided that she would like to do something to help educate the children of Arusha where she was now living. Her father in law gifted her some land on which to start her school which she named after St Jude - the patron Saint of Hopeless Causes! Through her family's connections with Rotary she was able to get initial support for this project through the Rotary Club of Armadale in rural NSW. The first school buildings were built by Rotary volunteers and teaching staff were also volunteers. Through her drive and determination Gemma was able to get support from many Rotary clubs in Australia, New Zealand, Canada and the USA: although most of the funding comes out of Australia. The school now has an annual budget of $A5m to support the 850 pupils in primary school (of which 420 board from Monday to Friday) and 1,000 secondary pupils who board fulltime. The younger primary students, who do not board, are brought to school by St Jude's buses each day from around Arusha. All pupils and staff are supplied with lunch from Monday to Friday, normally a mixture of beans and rice or ugali, and the boarders also get breakfast and dinner. The majority of the school's funding comes from the sponsorship of students with some money also coming from donations. The school has a strong sponsorship and promotions department which is staffed by young volunteers, mostly from Australia, who are on a two year contract. All other staff in the school, including all teachers, are Tanzanians. The state education system in Tanzania is vastly under funded with classes of more than 100 students (St Judes has 25 pupils per class), limited if no text books and teachers who are overwhelmed and not very motivated: resulting in huge absenteeism among state teachers. So you can imagine that the School of St Jude is very popular offering a free high quality education. From August to December each year potential pupils line up outside the school on Saturdays to sit the entrance exam. Each year up to 5,000 children apply for the approximately 60 places available in Year 1 so this is a huge and often emotional process. To be accepted to the school the children need to be both bright and poor with extensive checks done on the children who pass the entrance tests to ensure they pass the poverty test! New students are also taken at secondary school level to allow those from further outside Arusha, mainly part of the Masai tribe, to also get a good education. Only one student is accepted from each family to allow as many families as possible to have a well educated child who can help their family. The school is a non-denominational Christian school where grace is said before each meal. In line with the local population about 80% of the students are Christian and 20% Muslim. The students are encouraged to speak English at school and all lessons are in English with Swahili lessons each day. For most students English is their third language after their local dialect and Swahili, which is the official language of Tanzania. Wendy and I first meet Gemma when she spoke at the combined district 9910, 9920 and 9930 conference in 2005. She came back and stayed with us in Auckland and shortly after that we started to sponsor Victor at the school. Like all sponsors we have received regular correspondence from Victor and copies of his school reports etc. and it had always been our plan to visit the school and to hopefully volunteer to work there. And earlier this year we were able to follow our dream and spent 3 months at the school volunteering: Wendy as a teacher mentor in the primary school and myself guiding in their maintenance department. The school had grown so rapidly and was always expanding so that a lot of the regular maintenance work had been overlooked. Having now stayed and worked at the school Wendy and I are even more impressed with what Gemma and her team have achieved. All the students work very hard and there are no discipline problems as the students recognise the great opportunity they have been given. The Tanzanian education system is very much exam-orientated and all students at St Judes know that if they fail their exams they will be asked to leave the school. We have never seen such dedicated pupils throughout any school anywhere. Double click on left side image to change it.We really enjoyed working with all the staff at the school and witnessing their dedication to doing the best by the students but the highlight of our visit was meeting Victor and his family after nearly 12 years of sponsoring Victor. Victor graduates from the school next May and Victor's father told us 'that all the family are going to graduation and without us Victor would not have got such a good education so therefore you are part of the family and we expect you to be at his graduation'. So I guess we are going back next year as well!! Graduation week is a big event in the life of the school with many activities leading to the graduation which is a very emotional event for the graduating students and their parents. Next year will be the school's third graduation with most of the previous graduates going on to university. The next challenge for Gemma and her team is to arrange the funding to enable the St Judes graduates to go to university. The school has a number of accommodation rooms, from the time when the school was mainly staffed by volunteers, which are available to stay in. All sponsors and Rotarians are able to stay at the school for up to a week free of charge. The visitors centre can also arrange various tourist activities including safaris around Arusha. During our stay we revelled in two safaris, including a 4 day trip in the Serengeti, which were amazing experiences to see Africa animals in the wild. We also climbed on Mt Meru, which is in Arusha National Park and Mt Kilimanjaro is only 1.5 hours from Arusha. It costs the school $A2,880 per year to educate and feed a student. Therefore to fully sponsor a pupil costs $A2,880 per year although you can co-sponsor a student for $A1,440 per year and it is also possible to share sponsorship for $A720 per year or make a donation to the school. All sponsorship payments are tax deductible if channelled through Rotary NZ World Community Service.